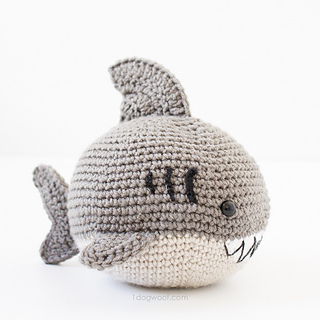 Introducing Bernard the Ball Shark! 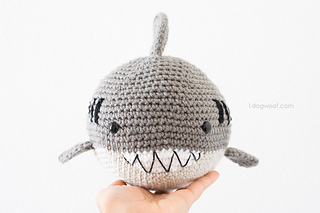 He’s a great white shark amigurumi/soft stuffed toy, in the shape of a ball, so he’s huggable and throwable! The kids will love tossing him back and forth, and he’s a great sport with it all. To make him, you’ll need 3 colors of yarn, as well as thin black yarn for the details (Lion Brand BonBons or embroidery thread) and 12mm safety eyes. 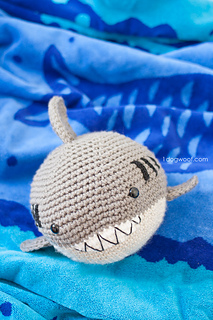 Free pattern can be found on my blog, or you can purchase a PDF for easy printing and downloading.